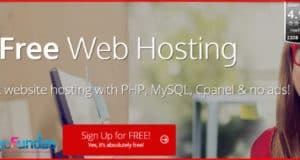 Are you looking for a reliable software to Rip your preferred DVD files with 100% output quality? This post provides the key details of WinX and MacX DVD Ripper Pro software to copy, edit and rip DVD movies in desired format. From side-splitting genre Rom-Coms to Sci-fi imagination, Bollywood movies have progressively entertained on-screen spectacles and prominently acting a pronovo as Hollywood. You may have collected a pile of DVDs for leisure enjoyment, but the fact of the matter is that every DVD disc is destined to run out of life after day-after-day load in the DVD drive, and it makes no sense to buy the same content over and over again. The good news with the looming death of the DVD is that DVD ripper makes the vulnerable DVDs reborn in other forms, and even helps to preserve the purchases for use in media delivery devices. If you are looking for the right DVD ripper to protect your movie library and meant to give your DVD movies that are playable on any device you choose, here are the best – WinX and MacX DVD Ripper, available for Windows and Mac users, respectively. WinX DVD Ripper Platinum is a Windows-based DVD ripper that can handle any DVD you legally purchased, including your copy-protected discs. It lets you copy DVD movies to computer, rip DVDs to AVI, WMV, MP4, etc. so that you can play them on your latest Android devices and other media players. This DVD converter also makes perfect compatibility with Windows 98, NT, 2000, 2003, XP, Vista, Windows 7 and Windows 8 (32 & 64 bit). MacX DVD Ripper Pro is regarded as the best DVD ripper for Mac (Yosemite included) that provides movie lovers with the easiest and fastest way to rip and convert commercial DVD movies, be they are published by Disney, Sony, Paramount or Warner Bros. Whether you are iPhone 5S owner or iPad Air user, you can easily play DVD movies on your latest Apple gadget with the help of the Mac DVD ripper. 1. Rip DVD from disc/ISO image/folder to a digital file in MP4, MOV AVI, MPEG4/H.264, WMV, FLV, M4V, MKV, etc. 2. Convert DVD for playing on handsets, slates, smart televisions, game consoles, etc. 3. Copy DVD to an ISO file, MKV, MPEG 2 at 1:1 ratio and extremely fast speed. 4. Supporting both the latest commercial DVDs and devices such as iPhone 5S/5C, iPad Air, iPad Mini with Retina display, Samsung Galaxy S5/4/3, Note 3, New HTC One, Surface Pro 2, PS4, Xbox One and Kindle Fire HDX. 5. Allow some particular parameter settings and editing like trimming, cropping, adding subtitles before DVD ripping. Despite WinX and MacX DVD Ripper work on different platforms, the two DVD rippers have similar functions and perform quite well on Windows and Mac. Below is the detailed instructions of WinX DVD Ripper Platinum to help you copy, rip or edit DVD movies. 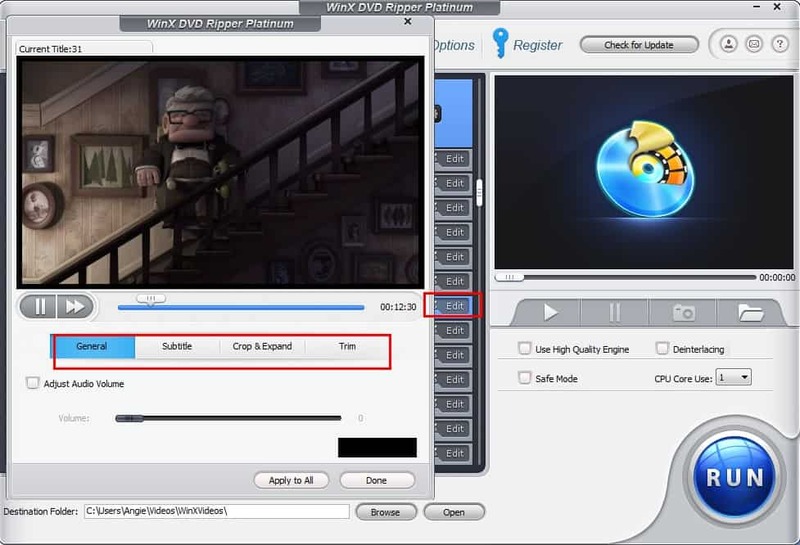 If you want to make a backup of DVD movie or rip DVD to favored output format, click “DVD Disc” to import the DVD, or you can also opt for “ISO Image” or “Folder” button on your computer storage after you successfully download & install WinX DVD Ripper Platinum. Scroll down the Output Profile to choose the output format as you wish. For a 1:1 DVD backup, just hit “DVD Backup” on the pop-up window. Pick a destination folder to save the converted video by clicking “Browse”. Then hit “RUN” button to start ripping. WinX DVD Ripper Platinum boasts excellent movie video editing features such that you can touch up your movie content at your disposal. If you want to cut off unwanted area of the video, remove the black bars, choose your preferred segments, add external subtitles, etc., you can choose the option “Edit” on the main interface. Or you can hit the “Merge titles” button on the top left of the interface to combine several titles into one. WinX and MacX DVD Ripper stand to serve most of your DVD ripping needs. T.hey provide fast DVD ripping speed, 100% output video quality and intuitive interfaces that many other similar tools cannot surpass. So if you are working with DVDs on a regular basis, the DVD rippers are a worthwhile addition to your computer. What do you think about this versatile software, WinX a.nd MacX DVD Ripper? Do let me know your thoughts through comments. Good to know that you have been using this helpful product, thanks for sharing your experience. I recently got the license to use this software too but I yet to try it. Looking at this I feel that it can come in really handy for my Mac. I have the code but I yet to install it. I will do that now.